Mount Greylock - Massachusetts' highest peak. Main Attractions: Largest peak in Massachusetts, fantastic views, Appalachian Trail, lighthouse observation deck, thick woodlands, campsites, Bascom Lodge. The highest peak in Massachusetts is Mt. Greylock at 3,491 feet. I guess you'll have to give this one a go since you'll want to make the claim that you've scaled the state's highest peak. The views from atop Greylock are unbelievable and you can access those views the easy way or the hard way. Drive up the 8 mile road to the summit or hike a rugged section of the Appalachian Trail all the way to the top. Either way, you won't be disappointed. The drive up takes you through thick alpine forest and eventually to fantastic overviews of the valley below. Hiking the Appalachian Trail here feels more like Maine or even Alaska if you let your imagination run wild a bit. Black bears, bobcats, and lynx might outnumber visitors and it wouldn't surprise me to hear one day that mountain lions decided to take up residence. Don't worry, you're chances of seeing any of these animals are extremely remote since they are nocturnal or wary of people. The terrain is ideal for providing plenty of cover and a wide swath of uninterrupted forest. If you do decide to hike up to the summit from the base you'll need to be in very good shape. It would be an all day affair even for a seasoned hiker. If you can do it, the rewards are great. You'll feel like you're in the middle of nowhere or back in the days of colonial New England where American Indians and European settlers met on what was then considered the wild frontier. Stop in at the visitors station at the base of the reservation and grab some maps and scout out the surrounding trials. In addition to an 11 mile stretch of the Appalachian Trial, the reservation has dozens of other trails you can explore. Thunderbolt, Hopper, Stony Ledge, Bellows Pipe, Mt. Prospect, CCC Dynamite, and Bernard Farm are the more noted trail names that lead up part of,or all the way to the top of, Mount Greylock. If you're leery about hiking the whole thing but looking for a workout, one option is to drive up a good distance and then hike the remaining distance to the summit. This would be a good alternative for those who are new to hiking or not in tip-top shape. For those looking for a real in-depth hiking experience it might be best to camp out at Mt. Greylock for a couple of days and just wander the 50 miles of hiking trails. As you ascend Mt. Greylock, the valley below gets smaller and smaller. Some of the views are just amazing and the surrounding towns seem like quaint Swiss Alp villages rather than suburban townships of modern America. Hiking to the top gives one a sense of real accomplishment and the 360 degree vistas are your well earned rewards. North into Vermont/New Hampshire, south into lower Mass./northern Connecticut, east towards Boston, west into the Adirondacks of New York State. On a crystal clear day you can see extremely far and because Greylock is so much higher than the surrounding mountains, there is nothing to obstruct the views. Mt. Greylock State Reservation towers over the North Adams/Pittsfield area. If the natural summit perch wasn't enough, a 100 foot tall lighthouse (photo is to the left) with an observation deck seals the deal. The War Memorial is fascinating in and of itself and you really should take a few moments to read the story of how it came to be and to appreciate the granite inscriptions and various artwork. People back then obviously were proud of their service to country and the memorial is an amazing accomplishment that probably couldn't be built today due to politics and red tape. After taking in the views, head over to Bascom Lodge for some snacks and relaxation. There's a dining area with wooden chairs/tables, fireplace with lounge chairs, and a gift shop. The lodge was built in the 1930's and the original rustic decor remains. Many Appalachian Trail hikers stay the night in the second floor dorm rooms that are available for a small fee. Visiting Greylock on a clear day is key. You'd be disappointed if the weather was overcast. The photograph to the right here is from a spot much lower than the summit and it's located at the end of Sperry Road (which is a left turn about halfway up the Mount Greylock summit road). It's also accessible by hiking up the steep Stony Ledge or Halley Farm trail system. From this vantage point unfolds a stunning view north into Vermont, which is pictured here, with a majestic close-up of Greylock to the east - which you just have to see for yourself! 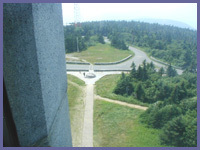 Some folks, including one of the rangers working at Mt Greylock, think this is the best view in the reservation. However, if you get a crystal clear day on top of Mount Greylock the views can be draw dropping. The spot where Sperry Road ends is a great choice if the Greylock summit road is closed and you need to hike for views, or you want to hike up from the valley for a fantastic view without having to hike the entire mountain. You can also attempt Thunderbolt Trail as a means for summitting Mt. Greylock. It's extremely challenging and not for the faint of heart. You MUST be in very good shape to attempt it though. Don't bother if you're new to hiking or not in top shape. It's vertical 2,000 feet of elevation in about 2 miles! That's about as tough as it gets in southwestern New England. 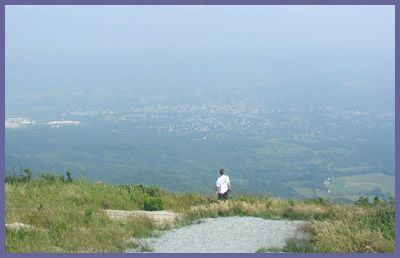 Contact Berkshire Hiking if you want a guided tour of Mount Greylock via Thunderbolt Trail or The Appalachian Trail. Directions: Mt. Greylock website These directions are taken directly off of Massachusetts State Parks website. 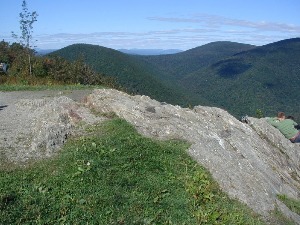 Mount Greylock is located in the northern part of western Massachusetts. From the east or west: Take the Mass Pike (I-90) to exit 2 in Lee. Follow Rte. 20 west to Rte. 7 north. Continue north from Pittsfield to Lanesborough. About 1.5 miles north of Lanesborough center watch for the Mt. Greylock Reservation and Visitor Center signs on the right. Turn right onto North Main St. and follow brown state reservation signs.